Words truly cannot detail just how excited I became upon finding out about this New Creation. My pace quickened, chest tightened, a little drool escaped my lips, and I think my eyes probably dilated like a pig walking into Famous Dave’s. There is truly only one way I can express why this had such an effect on me. 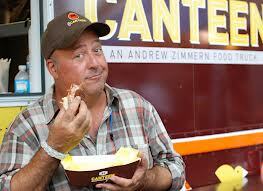 If you were to have one, only ONE, well-known Chef across the entirety of the U.S. to own and direct a Food Truck, it is Andrew Zimmern. Very few Chefs have been able to engrain themselves into food cultures and Street Food across the entire World as much as Zimmern has. With such a wide experience of enjoying the most abstract and, okay I’ll say it, “Bizarre” foods. Working among the many dishes of the street, there is no one more qualified to understand and offer that pure Cultural feeling and experience that a True Food Truck can create. Truly he proves this here, creating a menu of unique yet familiar, nostalgic items perfect just for the street. Hamburgers and Grinders are made from specially-found Cabrito Sausage (for those unaware, Cabrito is Goat), Sliders are made from Veal Tongue, and Gumbo is filled with Kramarczuk’s Andouille, Oysters and Crab. For dessert they grabbed Izzy’s own Ice Cream Sandwiches; but the real star of the entire Truck is a special “Dulce de Leche Shaved Ice,” with pound cake. Drinks and Potato Chips are all bought from handmade, artisanal, local and other such sources. Much like every other product they buy for the Truck. Currently taking residence in Florida for the winter, AZ really sets themselves onto the Serious Path and Habits that reminisces the Food Truck World. I only hope that they do come back to take up Minnesota Residence once again whence Summer arrives(I’ve come back from the future to write this… and they do, yay!). I hear there are plans to make multiple Trucks in the AZCanteen name, so I’m sure that won’t be a problem. Fun, delicious, a very pivotal experience for the Minnesota Foodie. Cabrito is cooked perfectly, bread for the sandwiches are grilled and crispy; and the local ingredients really shine. 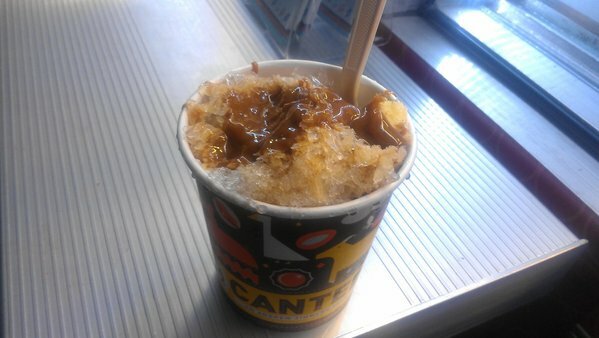 The Dulce de Leche Ice is a very unique experience, and perfect for the hot summer day. For my review on the Burger, follow This Link. The only counterpoint I can make is I wish the Gumbo had more sense of the Oysters that it’s highlighting, but a good Gumbo it still is. Individually each item is made for easy Street Eating. However, I find any real experience here is almost impossible to make without getting a cup of Gumbo or Shaved ice alongside one of the sandwiches, leading to fuller hands. On a recent visit, I found the burger to also be a sit-down preferred item. Keeping many good, affordable prices, along with a range for the smaller, lower costing items (small soup and shaved ice being an example). The locally sourced, higher quality items and service techniques do show, raising them another dollar or two above other trucks. But nowhere near ridiculous levels. 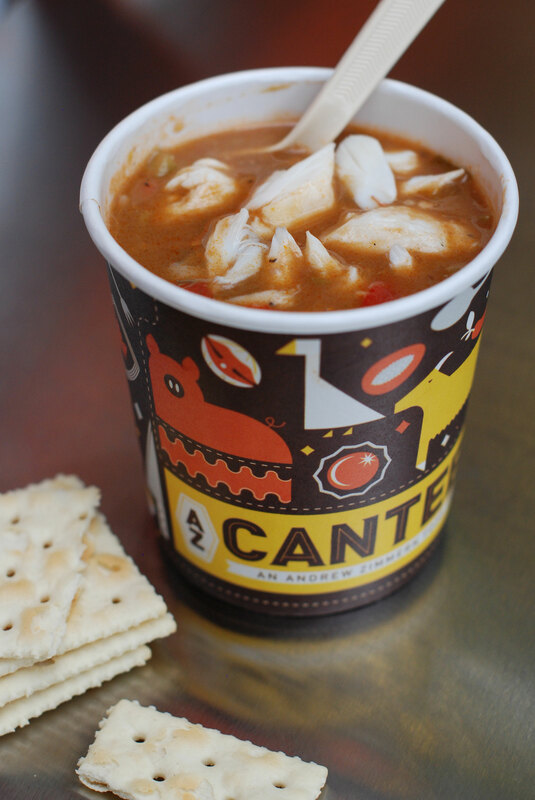 Average and expected, while many popular items like the soup and ice come in quicker due to efficiency. 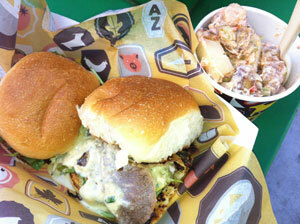 The Cabrito Burger DOES take a while to cook on its own, but one can wait it our with Gumbo or Shaved Ice. 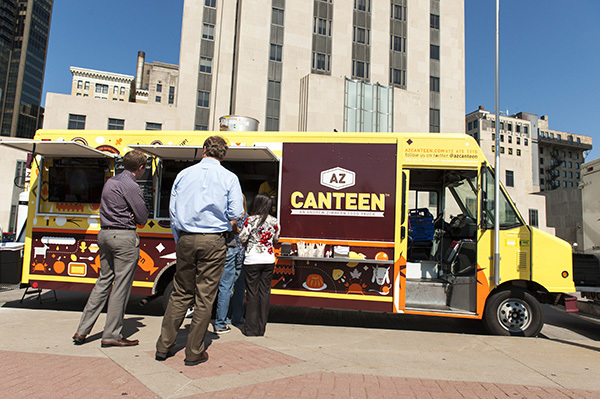 AZCanteen may not score the highest within the Trucks that I rate, but believe me when I say that I can’t think of many trucks that Truly embody what it means to be a Food Truck any more than AZ. Andrew Zimmern has taken his wide travels through the world and Translated his love for the Street Food Culture into what we see today. I look forward to going back in the future. Though I do not think they need to change their menu at all, there is a subconscious hope to see them play around with more new, unique things. The Chefs behind the register have REALLY good energy and drive behind them, and are extremely willing and able to chat up new customers. Even on my first visit they made everything feel familiar, warm and exciting all at once. Go here, go here now (or at least, soon as Summer comes back). There are two things you absolutely MUST get on the first visit. 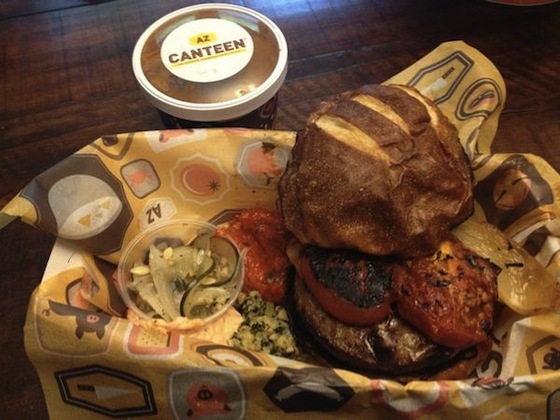 First, either the Cabrito Burger or Grinder; it’s their main, specialty item, and very well done. Second, to go with this, either a small cup of the Gumbo or the Shaved Ice for dessert. Or hey, get both, do a 3-course Street Lunch thingy (only Truck I know where it’s a real possibility and I would also suggest it). If able to, I might suggest getting the cup of Gumbo while waiting for the Cabrito to cook. It makes the wait tasty and fun, and is one less thing to worry about for carrying. The one item I would avoid is the Venison Tongue Sliders. Don’t get me wrong, they taste really good, but they’re a little higher in cost and you do NOT get much; only two thin slices per slider. If you have the extra money to spend, definitely give them a try one day. One very rare thing for me to suggest, the side items: I was disappointed to find they don’t make their own. However, the chips they buy come in a plethora of flavors, including Bacon. So if you’re looking for those little pre-made things, AZCanteen has a very good selection, same with their Sodas(but they make their own Hibiscus, so get that). This entry was tagged Burgers, Cajun, Dessert, Food, Food Truck, Goat, Local, Minneapolis, Minnesota, Sandwiches, St. Paul, Street, Street Food. Bookmark the permalink.